The club should follow a single plane from backswing to downswing. The one-plane golf swing is growing in popularity and is easier to perform than the two-plane golf swing as it requires less movement. Moe Norman, probably one of the most famous contemporary golfers to use the one-plane golf swing, was amazingly successful with this particular golf technique. He could pound the ball consistently down the fairway about 280 yards every time he stood up to the tee using the one-plane golf swing--something he called "Natural Golf." If the two-plane golf swing is working for you, continue with this method. If you are having some difficulty with the two-plane swing method, the less-complicated one-plane golf swing might be the answer for you. At address, place the club head behind the ball and fully extend your arms, aligning your arms with the club shaft, so that both your arms and club are on the same plane. Bend your knees more as you will be standing farther away from the ball than you would if you were using the two-plane golf swing. Place your feet slightly wider than shoulder-width apart for balance--to compensate for the longer distance between you and the ball--and turn your toes outward. Take your club back with your arms in a one-piece takeaway, swinging the club on plane with the shoulders at about a 45-degree angle when you reach the top of your swing. The club shaft should be parallel to the target line and your spine angle should be unchanged from your address position. Bring your club down in your downswing, releasing your upper body first, followed by your lower body. 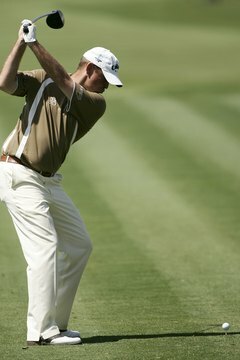 Your downswing should be on the same swing path as your backswing with arms extended. Square the club head at impact at exactly the same spot it was at address and finish with a full follow through.